Every reader knows that feeling when you are lost in a good book; so lost that you don’t even notice the sun is going down. You only truly notice it when you have to squint closer and closer in the failing light until you can’t read another word. Instead of reaching for overbright ceiling lights or lamps that cast an eye-watering glare across the page, why not invest in a light specifically designed for reading? In this article, we’re going to take a look at one of the best-selling LED reading lights on the market today. This product is a reading light that utilizes no less than 12 built-in LEDs to cast a high-quality glow and is explicitly designed for reading. Power is supplied via a built-in 1000mAh rechargeable battery. The device measures around six inches in length and 4.3 inches in width, making it a nice, small, and perfectly sized unit to clip to your book while delivering light exactly where you need it. This product is clearly designed for a person who enjoys reading. It is made to deliver a powerful light that makes reading more enjoyable. It also has adjustable light levels, making it easy to set it at a brightness that matches your surrounding conditions. What’s more is that because this reading light employs LEDs instead of traditional bulbs, it has a very focused light that will spill little light pollution into your surrounding area. If, for example, you are reading in an area where people are around, like in your bedroom, in the living room, or dorms, then this could be a handy feature. Inside the box, you will find one reading light with the dimensions we mentioned above. You also get one USB charging cable, but it should be noted that this cable cannot be plugged into a wall power outlet without an adapter (which is not included). However, it can be plugged directly into a USB port, such as on a computer or laptop, for charging. This light is packed full of useful features, but the standout has to be the fact that it comes with no less than 12 LEDs. That is double what many similarly priced reading lights have, which means this product is specially designed to give a very high light level. That could be particularly appealing if you often read in very dark conditions. Of course, that light means very little if it is not backed up by appropriate power. That said, this reading light has a 1000mAh battery. It should be noted though that because of the high number of LEDs, the runtime is not quite at the same level as other lights. For example, in the lowest light setting, it can operate for around 24 hours, while the highest light level will drain the battery in approximately six hours. Nonetheless, it’s great to see that the light has three different settings, allowing you choose the right light brightness according to your needs. Additionally, the clipping unit is also easy to use and constructed of sturdy plastic with silicone inserts on the grippers. This will help the lamp lock on neatly and tightly to your book. Using this device is pretty easy. You simply clip it to the back of your book and use the very flexible neck attachment to bend the light into the perfect position to cast a glow onto the book pages. One thing to bear in mind is that this is a rechargeable light. That means it doesn’t have batteries that need regular replacement when it runs low. Since the recharging process can take up to four hours, make sure you charge it accordingly as you don’t want to discover you are out of juice just as you settle down to start reading. Also, we highly advise that you keep an eye on the charge level so that it’s always ready to go when you need it. While this is a very well designed and useful reading light, if there is one weakness in the design it is the fact that it includes 12 LED lights. Because of this, the battery can be drained quite quickly during operation, and that would be inconvenient if you do a lot of reading marathons. Thus, you could consider the LuminoLite Rechargeable LED Book Light. It has the same size of battery but only has six LEDs, giving you a longer total runtime. It is, of course, not as bright as this reading lamp, so you’ll have to decide between extended runtime or light power. 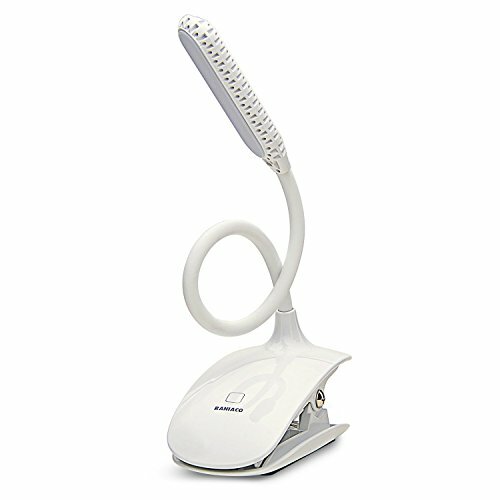 The Raniaco LED Reading Light is a greatly constructed premium reading light with a lot of useful features. Its decent operating time, high number of very bright LED lights, and ease of use explain why this is such a bestselling product. If you enjoy reading, and if you are looking for a truly high-quality reading light to enhance your reading experience, then you should indeed have this light at the top of your list.